Join us tomorrow night during Bold Italic's Microhood in the Richmond District! It'll be our first time participating in this event and we made sure to have some fun with our customers. Want to know what we're doing? Drop by from 6 - 8pm for your chance to win gift cards, merchandise and even a round of drinks. Posted on November 12, 2014 by Burma Superstar Restaurant Group. Thank you for the mention, Huffington Post! We are always grateful for our very patient and kind customers. Posted on October 6, 2014 by Burma Superstar Restaurant Group and filed under Reviews. Thank you Gogobot users for voting us as your 3rd Most Loved Restaurants in the 2014 Travelers' Favorites Award! We love you too!!! Posted on April 8, 2014 by Burma Superstar Restaurant Group. Thank you so much Huffington Post! We are so proud and grateful to be loved by San Franciscans! Posted on March 25, 2014 by Burma Superstar Restaurant Group and filed under Reviews. 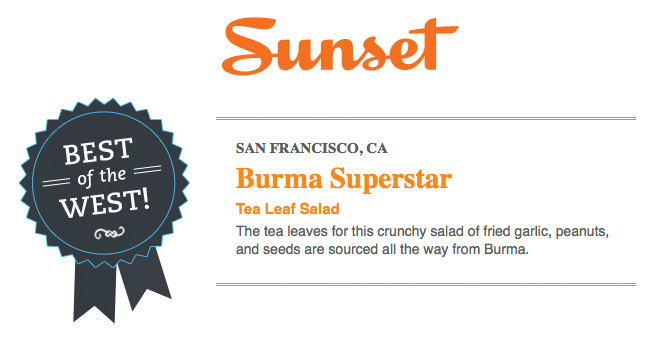 Burma Superstar received Sunset Magazine's 2013 Best of the West Award for our famous Tea Leaf Salad. Posted on November 11, 2013 by Richard and filed under Reviews. You can pick up one of our great tote's over at our new online shop. Quantities are limited, so order one today! 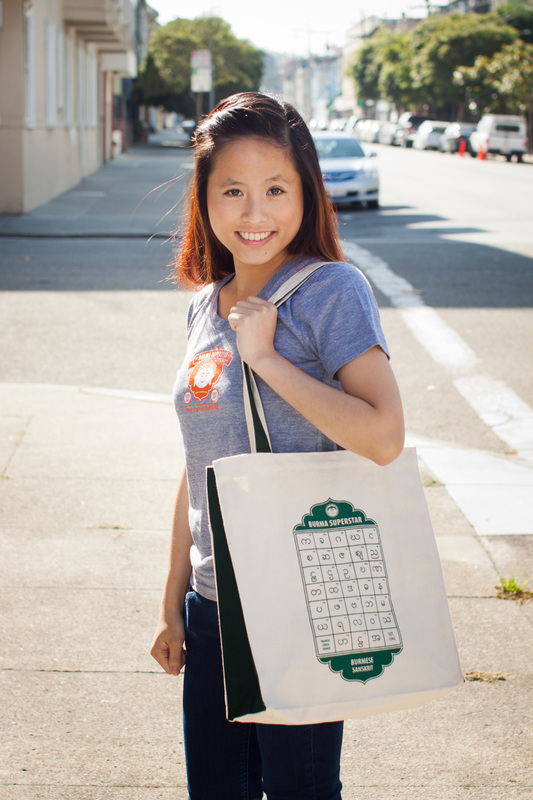 Our new Tote with design printed in green. Posted on November 2, 2013 by Richard and filed under Shop.